Waddikee Oval on SA’s West Coast reminds me of Adelaide Oval. Apart from the Moreton Bay Figs, heritage-listed scoreboard, immaculate playing surface, world class player and spectator facilities, and fetching cathedral. It’s a nasty Saturday of blustery heat and flies like blackbirds. A chorus of thudding car doors announces the arrival of the Kimba Cricket Club, skippered by Phil “Klingy” Klingberg. Fifty overs per side is scheduled so with two evenly matched XI’s, play can stretch, languidly, from noon to well beyond seven. Klingy wins the toss and bats. Waddikee is the reigning A grade premier. They have daunting bowlers and their fielding is Ponting-slick. Ours is a gallant innings. The men of Kimba are to grind it out; David Boon style. Veteran opening batsmen, Richard “Dickie” Clements, is bold. He combats the hostility, slices some sparkling shots through slips and accumulates an effervescent 11. The middle order is secured by Klingy with a Steve Waugh classic; gritty and rousing; especially so on two hours sleep. He piles up 13. After an epic struggle of three quarters of an hour we are dismissed. We are bloodied and bruised. Like our page in the scorebook. Kimba CC boasts a potent pace artillery including Marc “Soup Bones” Chapman, a gaunt version of Bruce Reid, and others who make Trevor Chappell’s over-arm action seem venomous. We are exactly unlike like Jeff Thomson. Waddikee is really going to have to dig deep to get our Bradmanesque 34. Following a hearty lunch, we stride onto the crisp outfield to warm up. This is a significant game as spots in the top four are up for grabs in the four-club competition. We prepare to defend our total. Dickie wonders how his horses are going. Badly, we discover. Needed Waikikamukau in his Randwick treble. Klingy inhales two quick gaspers. An old cricket ball is slung around, and occasionally caught. Happily, no-one is injured. Someone shouts, “We only have ten fieldsmen”. The deserter is found. Suffering in his HD Holden, Craig “Nogsy” Nielsen is rudely resuscitated and restored to battle. We warn him against operating heavy machinery and put him at slip. We slap lazy flies away. This torrid duel continues. Soup Bones is to open the attack. He is at the top of his run. It is longer than Fred Truman used to go on holiday. The grimy north wind hollers. Trying to anchor his clown feet, Soup Bones is desperate to not be blown through the southern goals, like a lost kite. A defining moment follows. A time when kings take actions that unite and fortify subjects. What Klingy shouts back to Soup Bones is paradigm-shifting. As captain he is a leader. A prophet. Ten blokes nod assent. An astute decision for the old ball spends most of its afternoon sun baking on the clubroom roof, adventuring into the prickly paddocks and like a grenade, exploding among the mixed doubles on the tennis courts. It, too, travels further than Fred Truman. In my brisk spell I am lofted through the goals by the Joyce boys for four majors. Cricket balls, surprisingly, enjoyed better working conditions in Medieval Yorkshire. Batting practise by Waddikee elongates play to 1:30. Despite commencing ten minutes late and a considerable break between innings. With vital hydration stoppages we return to Kimba in the dark. Klingy and Soup Bones invite all into the pub for some richly earnt refreshment. In the merciless glare of Sunday morning those who have to, try to explain themselves. And yet again we make our dusty ways through to our Mondays. 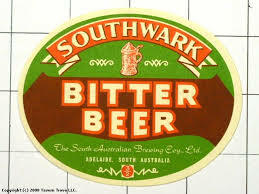 But, of course, at season’s end, having made the finals, we relish the bonus box of Southwark.